In the UK, a septic tank is generally used on farms and houses where no mains sewage drainage is available. A cost effective septic tank installation is now available from Morclean to BS6297 standards. The Morclean septic tank is a horizontal design and is more economical to install than a same capacity, cylindrical septic tank. The septic tank is two chambers and a dividing wall that separates waste solids from waste liquids It has openings midway between the base, at the top of the tank. Standard anyway covers and lids are fitted to both chambers via a 600mm turret. 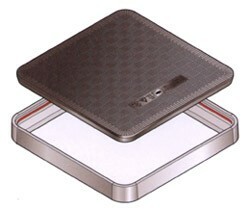 Due to the weights involved, covers and lids are expensive to transport and often cost more to ship than they are worth. We advise you source your own. Covers and lids can be purchased from most builders merchants and below is a guide to assist you choosing the best type for the duty. When waste water and solids are flushed into the septic tank, the waste solid matter is retained within the first chamber and the waste water is allowed to pass through the second chamber to an irrigation system. A percolation test, as outlined in PPG4 and BS6297, will determine the size of the irrigation system required. 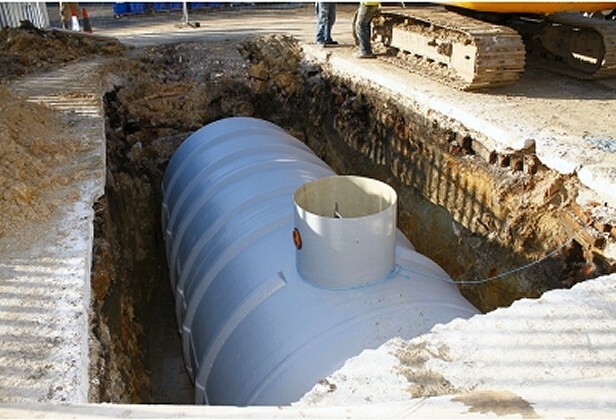 A septic tank generally has a capacity between 4,000 to 7,500 litres and is connected to an inlet pipe of waste water at one end and a septic drain field at the other end. The T pipe connections allows liquid ingress and egress, leaving any crust undisturbed. Waste water flows into the tank, solids settle in the first chamber and scum floats to the surface. Anaerobic action digests the solids, reducing the volume. Further settlement takes place in the second chamber when the liquid outflow passes through the opening in the dividing wall. The settlement in the second chamber produces a relatively clear outflow through the outlet into the drain field. The few remaining impurities will percolate through the soil and return to the groundwater via evaporation as well as taken up through the roots of plants and trees, assisted by pipe work or drainage system installations. Undecomposed solid waste must be removed from a septic tank periodically or it will overfill and pollute the drainage field with undecomposed wastewater. Guidelines for treatment and disposal of sewage where no foul sewer is available. Avoid problems with a septic tank by following this guide. Excessive water engress could overload the system and cause it to fail. Checking for plumbing leaks and practicing water conservation will help the system’s operation. As with all septic tanks, the chambers will require a de-sludge to remove the solids which settle and gradually fill the tank, reducing its efficiency. The horizontal design allows for easier maintenance access. Periodic inspection and pumping of the septic tank is essential.